After reading about vacuum concentrating I wanted to try it out. I'm currently in the process of building a setup for it on the cheap. 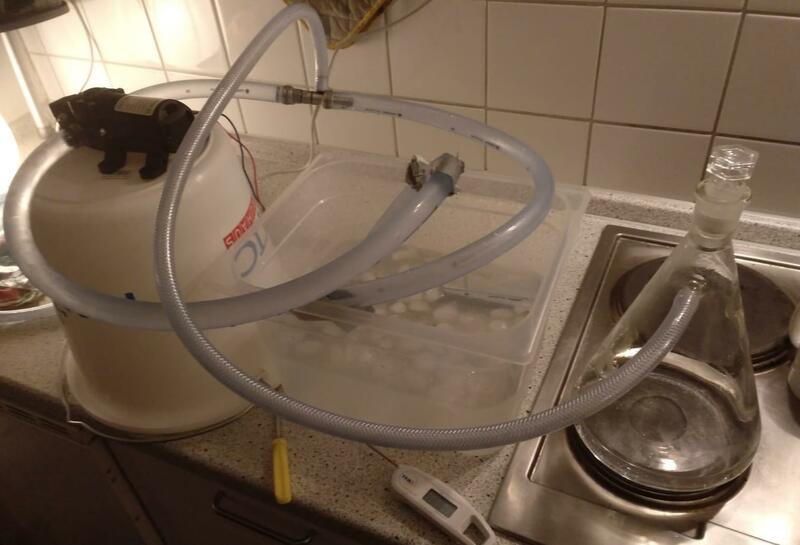 My current setup is the following an aspirator connected to pump that circulates ice water. The aspirator is then connected to a vacuum flask on the stove. There are some issues that I cannot fully solve. First the suction of the aspirator is variable based on position and if the line back to the ice bath is under water or not. But a vacuum is definitely created. @DiggingDogFarm is there something wrong with my circulation setup? The second is that my water got way over 70°C even with an ice water bath. It might be that my stove top was at a too high temperature. I'll make a new test run next weekend to rule this out. To test my vacuum I ordered a vacuum gauge to test is my aspirator is even working as intended. I hope to get this project working because it would be nice if there was a way to make vacuum concentrations at home without spending a lot of money.